It dedicated a new temple at La Salle and Goethe in 1895. The Chicago Tribune covered the dedication on May 18 of that year. During the construction of this temple, the congregation met at a nearby location at Division and La Salle. Prior to that, the congregation's temple was located at Walton and Rush. 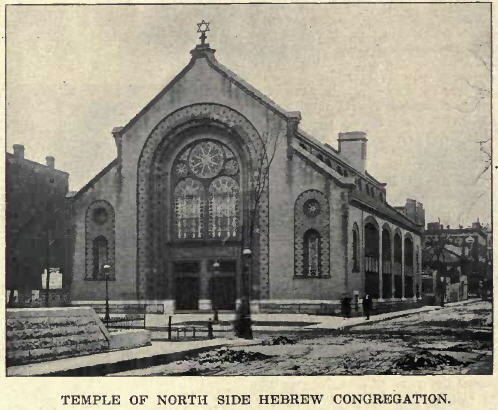 In 1915, it moved to a new temple at Grace and Pine Grove and was listed as Temple Sholom rather than the Congregation of the North Side. Public domain thumbnail image from The Jews of Illinois (Chicago : Bloch & Newman, 1901), page 342. Available through the Internet Archive.